At Kareo, we believe that healthcare providers should focus on caring for patients and providing excellent service—not sweating over claims and patient statements. Our work with over 50,000 medical providers has given us the background and expertise to know what works, what doesn’t, and why. Our specialty-focused billing experts are always there to help. Think of Kareo as an extension of your own staff. Integrated cloud-based technology keeps you current in a continuously changing landscape. Established best practice processes help you to avoid all too common billing errors. What is Kareo Smart Workflow? Smart Workflow is about doing things right the first time, every time, while identifying and eliminating the root cause of mistakes. We’ve created a set of tools and procedures that make intake easier, coding more effective, and turnaround time for collecting money more effective. To set you up for long-term success, your dedicated Success Coach will walk you through the data gathering process. You’ll understand what you need on the front-end so your medical billing can be streamlined on the back-end. We support your office staff in the critical role they play. Our modern technology and proven processes automate time-consuming tasks and simplifies workflows with easy to learn and quick to navigate scheduling, check-in, billing tasks and more. Kareo offers award-winning EHR, Native iPad EHR, and Charge Capture technology to reduce data entry and errors. 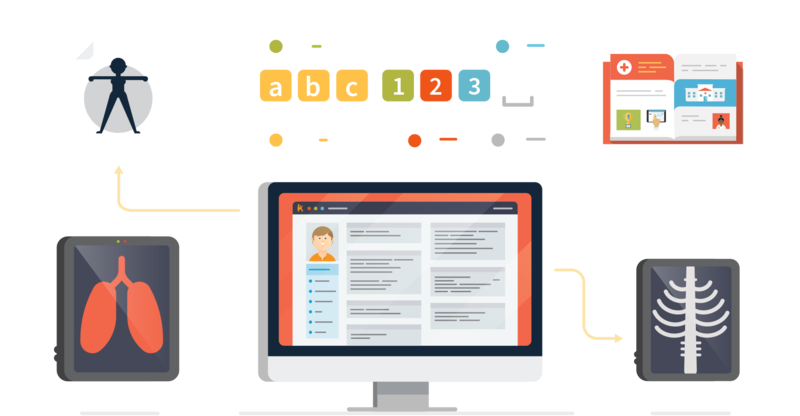 Our built-in Rules Engine ensures coding is correct at the point of entry to save valuable time and help you get paid faster. Building upon our collective experience with over 45,000 providers and hundreds of billing companies, we offer the best practices, processes, insights, and technology to help make your billing more effective. Robust analytics help you stay on top of your billing, understand your productivity, and track your performance. We measure key performance indicators so we can actively look for ways to find your practice revenue. DOCTOR DESIGNED AND APPROVEDKareo’s proven, technology automates tasks and simplifies workflows with easy to learn scheduling, claim tracking, billing tasks, analytics and more. Follow your claims from charge submission to payment posting. 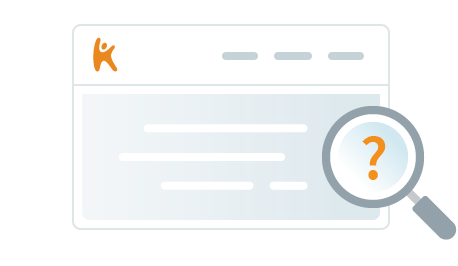 Claim Tracking lets you monitor where your claims are and what's being done to get you paid. 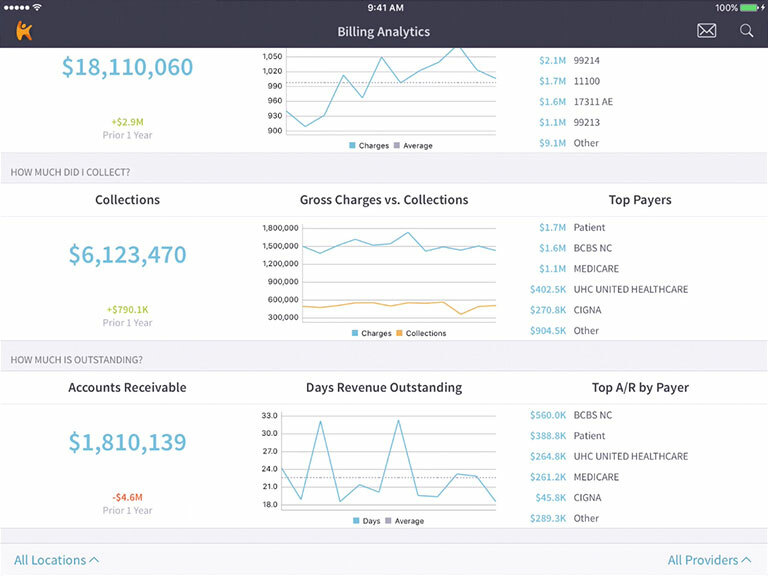 Stay on top of your billing, productivity, and track your performance. 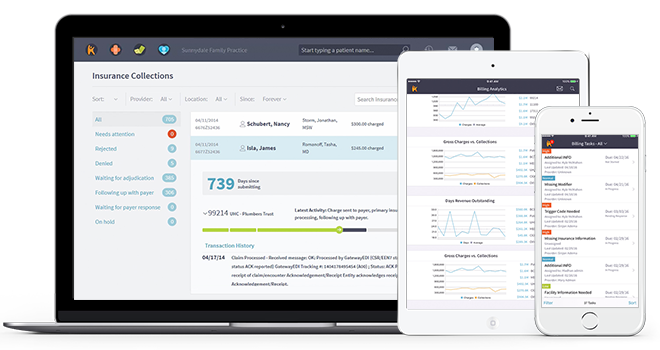 We measure key performance indicators and look for ways to find your practice revenue. Don’t let billing tasks slow you down. Manage all your tasks in one, easy-to-use inbox. And with Kareo Mobile you can view and complete tasks anywhere. With Kareo's medical billing experts and best in class software and services working for you, you can be sure your billing and claims are being taken care of. Add to this our entire network of knowledge and experience, and you’re way ahead. When you sign up with our Medical Billing Services, you get more than just billing expertise—you get a team of specialists dedicated to your success. Whatever billing issue you encounter, we can help because we’ve been there before. With Kareo Medical Billing, you don’t just have a team behind you—you have an entire network. Harness the collective experience of every Kareo practice and practitioner. More knowledge is better for business. Schedule with ease and confidence. Built in eligibility verification reduces denials and the work denials require. Capture charges at the point of care, reduce duplicate data entry, and minimize errors. Available on the web and mobile. Produce cleaner, more accurate claims automatically with our nationwide billing rules engine. 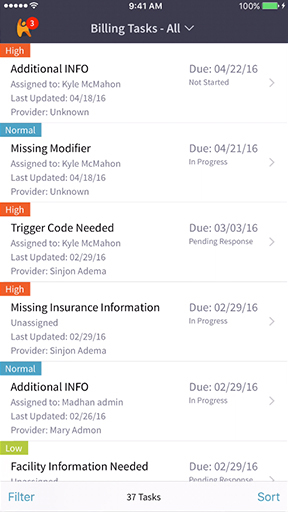 Monitor all your claims, check their status, and see what is being done to get you paid. 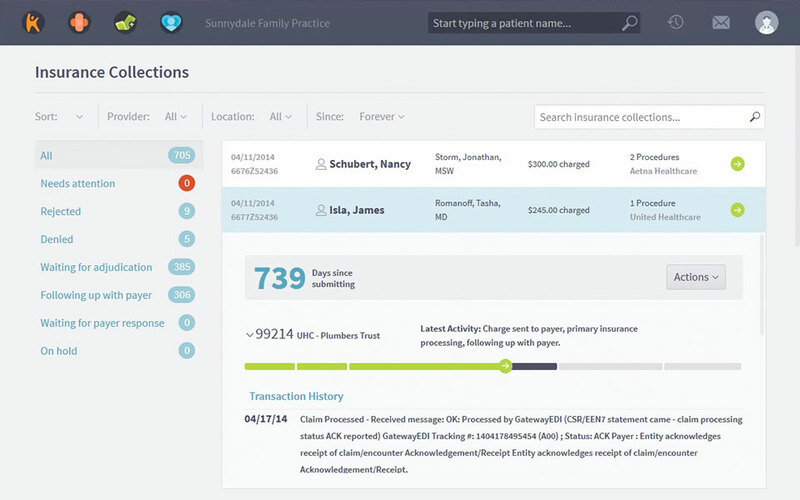 Streamline your day by managing and completing all your billing tasks in one, easy-to-use inbox. Support your staff's entire practice workflow including managing patients, uploading documents and sending secure messages. Get complete visibility at a glance by showing you outstanding items that need your attention for the day. Ready to speed up your collections? Enter a few fields to let us know a little about your and your practice’s needs. A specialist will follow up with a quote, ready to help with questions or setting up your new billing service. We want you to be a Kareo customer for life. We believe in the power of independent practice, and we want you to succeed. And we believe Kareo will help you do that. "Kareo is the best software out there." "Kareo support has been fantastic." – Dave Stuart, Maine Physical Therapy Billing Inc.
"What used to take two employees a weeks worth of work, now gets done on my day off in a couple of hours...on my back porch." Kareo makes it easier and more rewarding for you to run an independent medical practice. Plan the launch of your new practice carefully and use the best practices laid out in this guide to help achieve success. The business of medicine is growing more complicated every day. 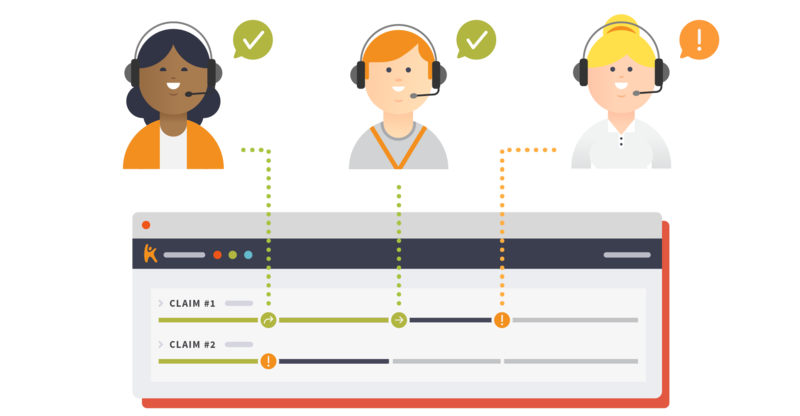 At some point, many practices ask… Should we hire a billing service? This white paper can help you answer that question and make the best choice for your practice. Are there any setup fees or long term contracts? There is an implementation fee of $2,500. $2,000 of that is waived when you sign a one-year managed billing contract. I see that you have different plans with different prices. How do those work and what do I need to know to choose the right plan? It is best that you get a free consultation with one of our Solution Consultants to identify your needs so you can choose the right plan for your practice. You can sign up now and start using your account immediately. Onboarding generally takes about 30-45 days. Refer to the onboarding guide to learn about the steps of onboarding. Can you import my data into Kareo? Yes. Kareo does offer Data Import services. We are able to import a variety of data, ranging from patient demographics to insurance lists. There may be a charge for our import services, which will depend on the kind of data we will be importing. The price generally ranges from $250 to $1500, however Medisoft customers are free of charge. We are able to complete most projects within 5-7 business days. You can provide your data in a variety of formats, including a Comma–Separated Value (.CSV) or Microsoft Excel (.XLS), Text (.TXT), Access Database (MDB), etc. Alternatively, if you are unable to export/acquire your data, we can remotely access your system and attempt to acquire your data for you at no additional charge. If for some reason, I would like to discontinue my subscription, can I export my data? Yes. If you are not completely satisfied, you can export your data at any time at no additional charge. You can save a copy of your data to your local computer in standard file formats, such as Comma–Separated Value (.CSV) or Microsoft Excel (.XLS). This provides you with the flexibility to store a backup copy of your data on your own computer or take your data with you if you ever decide to cancel your subscription to Kareo. When do you start billing me for my Kareo account? Your billing starts on the start date listed in your order. You will receive your first invoice approximately 30 days after your start date. Where can I review your agreement and pricing details? Do I need to set up an account with a clearinghouse? Are there additional fees? There is no need to set up an account with a clearinghouse, and there are no additional fees for electronic claims and remittance services. Our Enrollments team will assist you in enrolling with Zirmed, the clearinghouses used by Kareo. 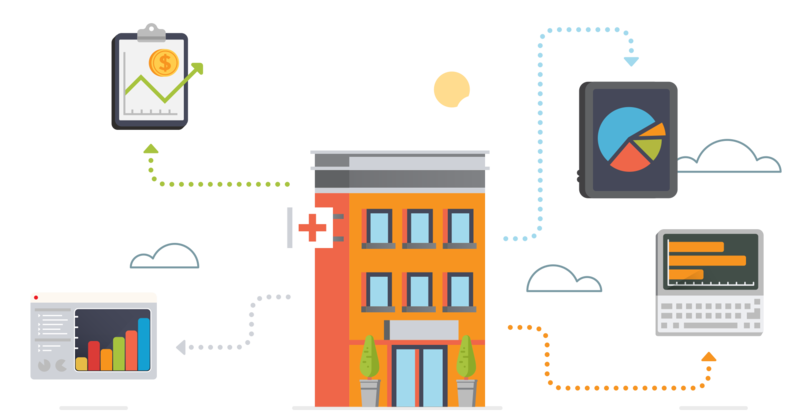 Kareo offers an integrated platform that includes cloud-based medical billing software for your practice combined with electronic connectivity to insurers, all provided under one affordable fee structure. How soon can I begin sending electronic claims? Onboarding generally takes about 30-45 days. Refer to the onboarding guide to learn about the steps of onboarding. What type of support can I expect after signing up? We offer a complete onboarding and training program with your subscription. Our team will be available to answer your questions as you complete the essential steps of your onboarding including watching our training videos, setting up a provider, enrolling in electronic claims, sending your first batch of electronic claims, and having your claims accepted by at least one major insurance company. What kind of support can I receive once I've completed the implementation program? Kareo offers convenient self–service customer support resources at no additional charge with every subscription. This includes online help, user manuals, guides, training videos, knowledge bases, and our user community forum. You also receive ongoing help with any electronic claims or electronic remittance enrollment questions at no additional charge. We also offer email, chat, and phone support options. What days and hours is your support available? Kareo support can be reached Monday through Friday, 5 AM – 5 PM (Pacific Time), excluding national holidays. You can email: support@kareo.com, chat with a live agent: www.kareo.com/chat, or phone: 1-888-775-2736. 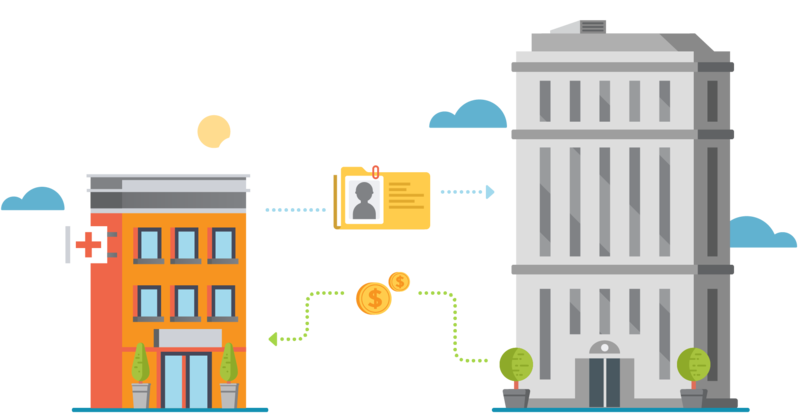 Can I process credit card payments from patients using Kareo? Patient credit card on file or paying online 3.9% + $0.30 tax per transaction. Can I use Kareo to submit electronic claims to all insurance companies? You can submit electronic claims to more than 4,000 insurers through Kareo. We support Medicare, Medicaid, Blue Cross, Blue Shield, and Tricare in every state. We also support major national insurers, such as Aetna, Cigna, Humana, and United Healthcare, as well as local IPAs and smaller insurers. To find out if you can submit electronic claims to a specific government payer or commercial insurance company, check out the Kareo medical billing software payer list. Which insurance paper and electronic claim formats are supported by Kareo? 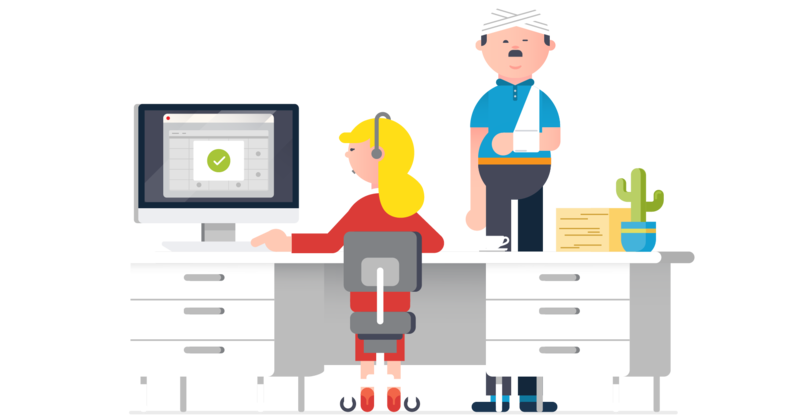 We currently support professional claim formats, used for provider charges, using the CMS 1500 paper claim format and ANSI 837p electronic claim format. We also support institutional claim formats, both UB-04 and 837I, for Ambulatory Surgical Centers (ASC), Comprehensive Outpatient Rehabilitation Facility (CORF), and Outpatient Rehabilitation Facility (ORF). Can I use Kareo to bill insurance companies for Out-of-Network providers? It is our experience that each insurance company may have a different policy regarding how they reimburse for medical claims associated with Out-of-Network providers and the level of electronic services (electronic claims, remittance, and eligibility) they support with Out-of-Network providers. These varying policies are independent of the medical software or clearinghouse used to bill them. So we recommend that you call each insurance company to receive a definitive answer regarding their claim reimbursement process and the electronic services they will allow as it relates to Out-of-Network providers. What are the system requirements for Kareo? Windows 7 or newer version of Windows, 1 gigahertz (GHz) or faster 32-bit (x86) or 64-bit (x64) processor, 1 gigabyte (GB) RAM (32-bit) or 2 GB RAM (64-bit), a stable high-speed internet connection such as DSL, Cable Modem, or T1, and a 17” monitor with 1024x768 screen resolution. For a better Kareo desktop application experience we recommend: Windows 7 or newer version of Windows, 2 gigahertz (GHz) or faster 32-bit (x86) or 64-bit (x64) processor, 2GB RAM and a 19” monitor with 1280x1024 screen resolution. 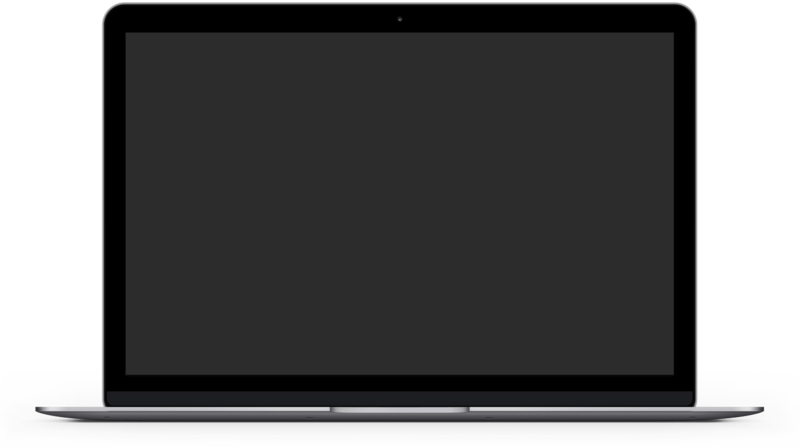 Can I run Kareo on a Mac? How do you handle security and backups? Your data is securely encrypted, stored, and backed up in the cloud. All your data being sent to and downloaded from our servers is protected with industry-standard encryption. Kareo is compliant with all HIPAA Privacy and Security Rules. For more information about security, please read our Security Notice.